Long ago, in childhood, when Summer reverberates and feels and throbs all over, it begins to circumscribe my body along with my self, and my body gives it shape in turn: the “joy” of living, of experiencing, of already foreseeing dismembers it, this entire body explodes, neurons rush toward what attracts them, zones of sensation break off almost in blocks that come to rest at the four corners of the landscape, at the four corners of Creation. 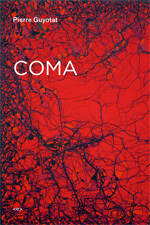 Winner of the 2006 prix Décembre, Coma is the deeply moving, vivid portrayal of the artistic and spiritual crisis that wracked Guyotat in the 1980s when he reached the physical limits of his search for a new language, entered a mental clinic, and fell into a coma brought on by self-imposed starvation. A poetic, cruelly lucid account, Coma links Guyotat’s illness and loss of subjectivity to a broader concern for the slow, progressive regeneration of humanity. Written in what the author himself has called a “normalized writing,” this book visits a lifetime of moments that have in common the force of amazement, brilliance, and a flash of life. Grounded in experiences from the author’s childhood and his family’s role in the French Resistance, Coma is a tale of initiation that provides an invaluable key to interpreting Guyotat’s work, past and future.